LeafFilter North - Leaf-Filter gutter systems grow moss! Sep 05, 2016 Hello, Thank you for your feedback. Please contact our service support team at 800-749-4566 so that we can assess the cause of the moss growth and find a solution to your unique situation. I must agree with the other complaint-comment on the Leaf Filter gutter system. If you have numerous deciduous, pines or cedar trees and get the typical tree debris build up, I sure wouldn't recommend Leaf-Filter! All that stuff sits and doesn't blow off on the next windy day. It gets embedded in the "surgical micro-mesh screen" and grows moss! True, the gutters don't clog, as the water cascades right over the gutter-cover and onto the area below. I have to use my "gutter brush" and from a wheelchair, cruise around the entire house and sweep off the gutter cover! 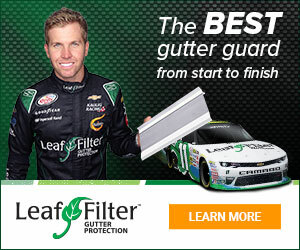 Product or Service Mentioned: Leaffilter North Gutter Guard. Review #183553 is a subjective opinion of User183553. Roger's post was is spot on. Companies need to quit using this site to bash each other. I have Leaf filter and have never had to clean it. If this post is ligitimate, this guy needs to share the video that Roger suggested. I don't have this product so I can't write about if it works or not. I do want to mention how transparent the anonymous user's complaint is. Why do competing companies use this forum to bash each other by posting bs complaints? If I am wrong about this I would love to see a video of this guy in his wheelchair cleaning off his gutter guard with a brush! If it is true it would replace the old lady in the commercials when she takes her power scouter to the Grand Canyon.